How to read the date of production of a tyre? 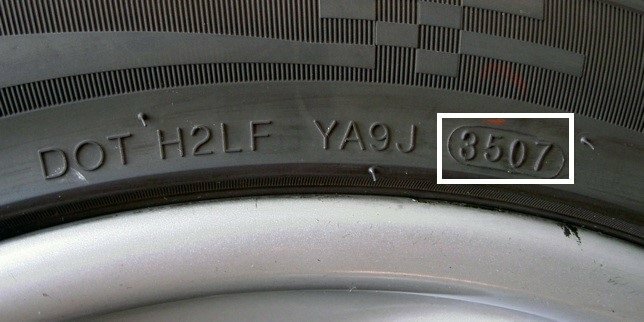 Every tyre has a batch number stamped on the sidewall along the bead area of the tyre as seen in the below image. The first 2 digits (35) indicate the week of production and the last 2 digits indicate the year of production. This means that the subject tyre is manufactured in the 35 week of 2007. What is the Date of production of TYRES we offer online? Tyresonline displays the year of production on the website itself against each product. As the week of every unit may be very difficult to maintain as it changes over time as we receive new inventory, If however, you need to know particular week of a tyre we can physically check it and get back to you. All the TYRES that we carry comply with Gulf Standards Organization regulations. What is the acceptable Year of production (DOT) for the TYRES I buy? What does the price of a Tyre include? Prices on Tyresonline.ae includes Installation, Balancing and Disposal of your old TYRES and VAT. Yes you have the option to pay on site IF you choose the Mobile Van Installer, subject to confirmed order online via portal and subsequent confirmation over phone. For all other purchases you are required to make payment using your VISA or Mastercard online via our web portal which is a secured mode of online payments. What are the most common mistakes I could make when I order a tyre? One of the most common mistake is to order the wrong size. It’s always better to check the tyre size from the sidewall of the tyre as seen in the image below. It's important to confirm by yourself which tyre size you need before ordering. We strongly suggest you check the vehicle, because, not all makes, and models have the same tyre size. Some cars have different tyre sizes for the front and rear. How long would it take to get my tyres installed? In most cases the installation can be arranged on the same day. However, to help you to plan better we have the option on the website for you to indicate your preferred date and time. The same will be reconfirmed by one of our customer support staff. How to read the tyre size ? There's always a set of numbers and letters that relate to the size of the tyre. 225 is the width of the tyre in millimetres. 75 is the aspect ratio or tyre profile. What is the Load Index, Speed Index on a tyre ? Next to the tyre size as seen above, the 91H at the end of the size represents the tyre’s service description. A service description identifies the tyre's load index and speed rating. The first two digits (91) represent the tyre's load index and are followed by a single letter (H) identifying the tyre's speed rating. 205/55R16 91H - The load index (91) is the tyre size's assigned numerical value used to compare relative load carrying capabilities. In the case of our example, the 91 identifies the tyre's ability to carry approximately 615 kilograms. The higher the tyre's load index number, the greater its load carrying capacity. A tire with a higher load index than that of the Original Equipment tyre indicates an increase in load capacity. 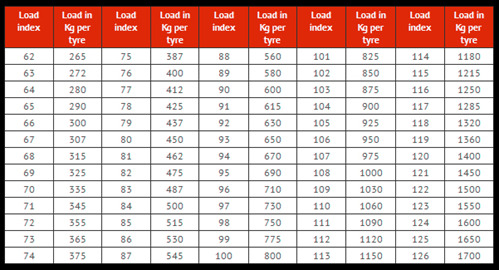 A tyre with a load index equal to that of the Original Equipment tyre indicates an equivalent load capacity. A tyre with a lower load index than the Original Equipment tyre indicates the tyre does not equal the load capacity of the original. When looking at light truck (LT) or newer Special Trailer Service (ST) tyres, there are two load indexes branded on the sidewall, separated by a forward slash. Using an LT235/75R15 104/101S Load Range C tire as an example, the load index is 104/101. 104 corresponds to 900 kilograms, and 101 corresponds to 825 kilograms. So what is the true load carrying capacity of the tyre? The answer changes depending on the situation in which the tyre is being used. Since LT tires are commonly used on trucks with dual rear wheels, they are branded with two load indexes. The first number indicates the load carrying capacity if the tyre is installed on a truck with a single-wheel rear axle, and the second number applies when the tyre is used in a dual rear application. Though it may seem counterintuitive that a tyre is rated to carry less weight when working in tandem with another tyre in the dual pair, the purpose is to build in additional reserve capacity should one of the two tyres fail, leaving the sole remaining tyre to carry the load normally handled by two tyres. Speed ratings were established to match the speed capability of tyres with the top speed capability of the vehicles to which they are applied. Speed ratings are established in kilometres per hour and subsequently converted to miles per hour. Despite the tyre manufacturers' ability to manufacture tyres capable of high speeds, none of them recommend the use of their products more than legal speed limits. The maximum operating speed of a vehicle must be limited to the lowest speed rated tyre on the vehicle. Speed ratings are based on laboratory tests where the tyre is pressed against a large diameter metal drum to reflect its appropriate load and run at ever increasing speeds (in 6.2 mph steps in 10 minute increments) until the tyre's required speed has been met. It is important to note that speed ratings only apply to tyres that have not been damaged, altered, under-inflated or overloaded. Additionally, most tyre manufacturers maintain that a tyre that has been cut or punctured no longer retains the tyre manufacturer's original speed rating, even after being repaired because the tyre manufacturer can't control the quality of the repair. Is Tyre Rotation important if so what is the correct rotation pattern ? Tyres should be serviced periodically following the rotation patterns provided in the vehicle's owner's manual or as established by the industry. Using tyre rotation as a preventative maintenance will equalize front-to-rear and side-to-side wear rates while enhancing wear quality and pattern noise. Any differences in wear rates indicate that tyre rotations should be done more frequently. Tyre rotation can be beneficial in several ways. When done at the recommended times, it can preserve balanced handling and traction and even out tyre wear. Tyre rotation can even provide performance advantages. Tyre rotation is recommended at every 10,000 kilometres. This can also be a good time to have your tires rebalanced if the vehicle has developed a vibration. It's also a good time to inspect the tyres for any damage, remove stones or debris from the tyre treads, check for uneven wear by checking the tyre tread depth and of course, checking your tyre pressure. Tyre rotation helps even out tyre wear by allowing each tyre to serve in as many of the vehicle's wheel positions as possible. Remember, tyre rotation can't correct wear problems due to worn mechanical parts or incorrect inflation pressures. While vehicles are typically equipped with four tyres, usually the tyres on the front axle need to accomplish very different tasks than the tires on the rear axle. The tasks encountered on a front-wheel drive vehicle are considerably different than those of a rear-wheel drive vehicle. Tyre wear experienced on a performance vehicle will usually be more severe than that of a family sedan. Each wheel position can cause different wear rates and different types of tyre wear. It is an advantage when all four tyres wear together because as wear reduces a tyre's tread depth, it allows all four tyres to respond to the driver's input more quickly, maintains the handling and helps increase the tyre's cornering traction. When your tyres wear out together, you can get a new set of tyres without being forced to buy pairs. If you replace tyres in sets of four, you will maintain the original handling balance. In addition, our suppliers constantly introduce new tyres, each of which improves upon their past product's performance. If you replace your tyres in sets of four, it allows you to experience today's technology, instead of being forced to match yesterday's. What tyre rotation pattern should be followed? The Tyre & Rim Association has identified three traditional rotation patterns covering most vehicles (equipped with non-directional tyres and wheels which are the same size and offset). The first being the "Rearward Cross" (Figure A); the second being the "Forward Cross" (Figure C); and the third is the "X-Pattern" (Figure B). The X-Pattern can be used as an alternative to A or C.
Today's performance tyre and wheel trends have provided the need for two additional tyre rotation patterns. The "Front-to-Rear" (Figure D) pattern may be used for vehicles equipped with the same size directional wheels and/or directional tyres. A "Side-to-Side" (Figure E) pattern may be used for vehicles equipped with different sized non-directional tyres and wheels on the front axle compared to the rear axle. If the last two rotation patterns do not provide even wear, dismounting, mounting and re-balancing will be necessary to rotate the tyres. Vehicles that use different sized directional wheels and tyres, and/or wheels with different front and rear offsets with directional tyres will require dismounting, mounting and re-balancing to rotate tyres. While many vehicles are equipped with temporary spares that cannot be included in a tyre rotation program, if the vehicle's four wheels and tyres on the ground match the spare wheel and tyre (if non-directional and not branded "for temporary use"), they should be included in the tyre rotation pattern. Follow the vehicle manufacturer's recommended tyre rotation procedures, or if not available, insert the spare in the right rear position at every rotation. Place the tyre that would have gone to the right rear in the trunk as the spare until the next tyre rotation. Five tyre rotation results in equally distributed use that will help maintain equivalent tread depths on all five tyres throughout their life. When applied to many four-wheel drive and all-wheel drive vehicles, this is required to prevent driveline damage if a flat tyre forces a new spare to be put into service with partially worn tyres on the other three-wheel positions.